^ Coffin, LS; Newberry, A, Hagan, H, Cleland, CM, Des Jarlais, DC, Perlman, DC (January 2010). “Syphilis in Drug Users in Low and Middle Income Countries”. The International journal on drug policy 21 (1): 20-7. doi:10.1016/j.drugpo.2009.02.008. PMC: 2790553. PMID 19361976. https://www.ncbi.nlm.nih.gov/pmc/articles/PMC2790553/. ^ Gao, L; Zhang, L; Jin, Q (September 2009). “Meta-analysis: prevalence of HIV infection and syphilis among MSM in China”. Sexually transmitted infections 85 (5): 354-8. doi:10.1136/sti.2008.034702. PMID 19351623. ^ Karp, G; Schlaeffer, F; Jotkowitz, A; Riesenberg, K (January 2009). “Syphilis and HIV co-infection”. European journal of internal medicine 20 (1): 9-13. doi:10.1016/j.ejim.2008.04.002. PMID 19237085. ^ a b Eccleston, K; Collins, L; Higgins, SP (March 2008). “Primary syphilis”. International journal of STD & AIDS 19 (3): 145-51. doi:10.1258/ijsa.2007.007258. PMID 18397550. ^ Franzen, C (December 2008). “Syphilis in composers and musicians--Mozart, Beethoven, Paganini, Schubert, Schumann, Smetana”. European Journal of Clinical Microbiology & Infectious Diseases 27 (12): 1151-7. doi:10.1007/s10096-008-0571-x. PMID 18592279. ^ Stamm LV (February 2010). “Global Challenge of Antibiotic-Resistant Treponema pallidum”. Antimicrob. Agents Chemother. 54 (2): 583-9. doi:10.1128/AAC.01095-09. PMC: 2812177. PMID 19805553. http://aac.asm.org/content/54/2/583.full.pdf. ^ a b Kent ME, Romanelli F (February 2008). 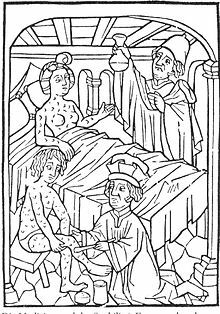 “Reexamining syphilis: an update on epidemiology, clinical manifestations, and management”. Annals of Pharmacotherapy 42 (2): 226-36. doi:10.1345/aph.1K086. PMID 18212261. ^ Woods CR (June 2009). “Congenital syphilis-persisting pestilence”. Pediatr. Infect. Dis. J. 28 (6): 536-7. doi:10.1097/INF.0b013e3181ac8a69. PMID 19483520. ^ G. W. Csonka (1990). Sexually transmitted diseases: a textbook of genitourinary medicine. Baillière Tindall. p. 232. ISBN 978-0-7020-1258-7. http://books.google.com/books?id=o6NrAAAAMAAJ.